I put this recipe together because it came up on the internet as a traditional Scottish dish. My brother Wayne discovered that our family has Scottish roots. After he traveled with his wife and family to Scotland finding the birth castle of my ancestor Alexander Arnott, we had a family party where we all wore plaid scarves, watched a presentation, and chowed down on everything as close to Scottish as we could. 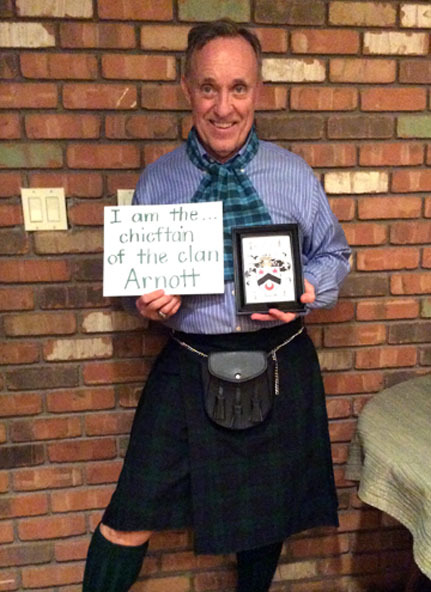 Because our brother is obsessed with genealogy and is even willing to wear a skirt to our party we, decided to vote him the current Chieftain of the clan Arnott. 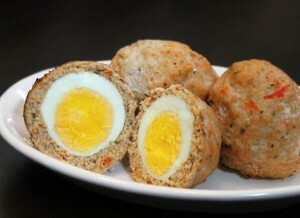 Apparently Scotch eggs were invented in 1738 in London but the idea spread throughout Europe. Traditionally Scotch Eggs were breaded and fried but I thought it would be much easier to skip the breading and just bake them. Besides I’ve got Scottish, Danish, Swedish and English blood, so this is my melting pot version of Scotch Eggs. It also happens to be a version my Paleo ancestors would’ve liked as well. Consider doubling the batch because they make great quick snacks and are awesome for lunches. They are know as “picnic eggs”, “snack eggs”, “egg bites”, “savoury eggs” or the like. You might find them in “British-style” pubs and eateries in the United States usually served hot with dipping sauces or can be found at some Renaissance Festivals. I’m thinking this could also end up being a family favorite tradition for Easter. Place the eggs into a pan with an inch of cold water covering the eggs. Heat the water to a rolling boil. Immediately remove the pan from the heat, place a lid on it and let it sit to continue to cook for 10 minutes for this recipe because we want the yolk to be slightly soft. Set the timer for this so it doesn’t cook longer, making the yolk harder. We want to keep the egg hard enough to wrap meat around it but soft enough in the center so that as it bakes in the oven with the meat, it will not get too dry. Once it reaches the 10 minutes, pour out the hot water and replace with cold water and ice and let sit for a minute. Next remove the eggs from the water and crack and remove the shell. Set the peeled eggs aside to prepare the meat. Remove the core from the red bell pepper and cut it up into chunks and place in a food processor with the blades in the bottom. I added the bell pepper because it is delicious, but it also helps keep the meat patty from sticking too much to your hands when trying to pat it around the egg. Add the ground pork or chicken, sea salt, cut up green onion, minced garlic and seasonings of your choice. Blend until it is well blended and smooth. Lightly grease a cupcake pan with coconut oil. Take a handful of the seasoned meat mixture and make a patty in your hand by flattening it out. Place a boiled egg in the center of the meat and wrap the meat around the egg until it meets and seals together all around the egg. Add more meat if needed. Place the egg in a cupcake indent. Once all the eggs are in the pan. Place the pan in the oven and bake for 10 minutes. Remove from the oven and tilt the pan to remove excess liquids. Place back in the oven and bake for an additional 15 minutes. Remove from the oven and again, pour out excess liquids. Turn the eggs over in the indent and bake for another 5 minutes. Once they are done, you may eat them warm or let them cool off and eat at room temperature.